Viewcam — Mobileline Systems Ltd. The “ViewCam” Remote Camera is designed and built by Mobileline Systems Ltd. It is a weather proof, enterprise class, portable satellite / cellular camera system that can be used throughout most parts of the world. It is designed for viewing remote conditions where a high definition image is required. The system incorporates innovated battery saving technologies which makes it useful for longer term deployments. It is ideal for monitoring and documenting forest fires and environmental conditions. The system is a service that includes a secure website application that provides secure online viewing, documenting and control of the camera and images. The Remote Camera system is an easy, non-technical setup and configuration process. The system is powered by batteries so it is not capable of providing full motion video, because of the high power needed for full motion video. Administrative users of the system can set the camera Image Frequency for each Project they are monitoring by logging into the secure viewcam.ca website. The fastest image frequency is one image each 15 minutes. Administrators can select slower image frequencies ranging from one image each 15, 30 minutes or 1 to 24 hours. The all-weather camera system connects to Mobileline’s secure viewcam.ca server by either a wireless satellite or cellular modem included with the system. The system has 2 tripods in which the camera is positioned on one and the satellite modem is positioned on the other. The camera housing encloses the cellular modem and system electronics. If the wireless connection is cellular only one tripod is used. 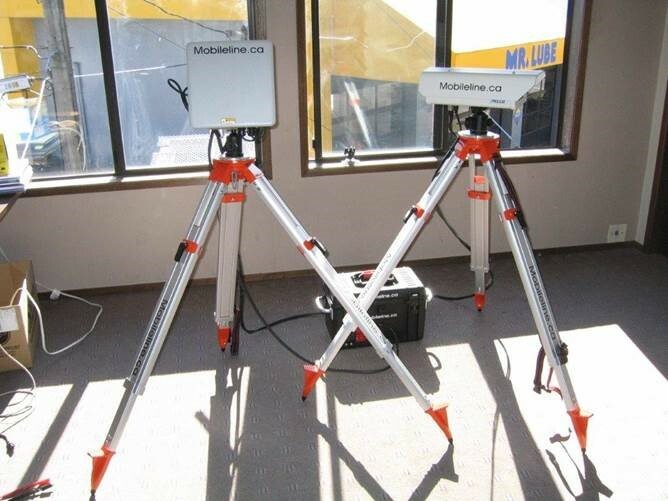 A satellite connection requires both tripods to be used. When a satellite connection is used, the satellite antenna must be pointed to the satellite. This is an easy process which uses sound for pointing the proper satellite antenna location. The satellite connection uses the Inmarsat BGAN Satellite network supplied and invoiced by Mobileline Systems Ltd. On-site training and instruction is provided. In addition, there are full help instructions at http://www.viewcam.ca/help as well as telephone and Email support.